Yuxiang is a paving stones exporter, produces and exports the highest quality concrete paving tile, mold paving slab and so on. Tactile paving is an important element of any paved area. It is designed to assist visually impaired pedestrians by providing them with a specific, detectable indication of crossing points, potential hazards, platforms and safe routes for travel. Yuxiang offers a complete range of concrete paving tile, mold paving slab, Tactile Paving Tiles, China Blind Stone, paving stone slabs, paving block, brick paving, garden paving stone, garden paving slabs, blinder paver. 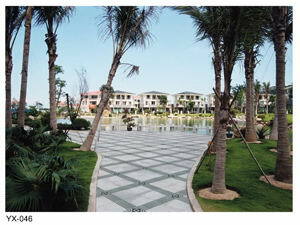 As a specializing paving stones exporter, we do our better to offer good concrete paving tile, mold paving slab, etc. 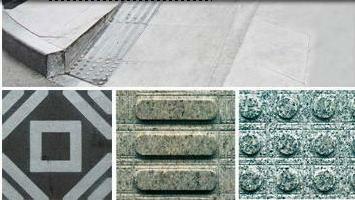 Concrete paving tile to identify potential hazards & advise pedestrians to proceed with care. Cycle way paving is used at the beginning and end of a shared pedestrian/cycle route, which is not separated by different levels. 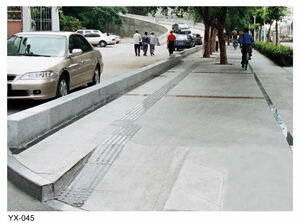 Concrete paving tiles are laid in two orientations, transverse to denote the pedestrian path, and longitudinal to denote the cycle path. The concrete paving tiles is used to alert pedestrians, including visually impaired, about the proximity of a cycle way within a shared cycle way/footpath route, also provide a visual and physical indication to cyclists on the position of the central limit, whilst also providing a visual and easily detectable underfoot warning to all pedestrians.